Russian, US and UN delegations will today discuss preparations for the international conference on Syria in Geneva. Russia will be represented by the deputies of foreign affairs minister Gennady Gatilov and Mikhail Bogdanov. Gatilov said Russia expects to reach an agreement on the format of the conference. “The purpose of the trilateral meeting in Geneva is to discuss the format of the international conference on Syrian settlement,” Gatilov said through his Twitter account. “It is necessary to jointly ensure implementation of Geneva communiqué by both Syrian government and opposition in order to reach agreed solutions,” he wrote. The US has sent the deputy of state secretary Wendy Sherman and acting assistant secretary of state for near eastern affairs Beth Jones. The UN will send its peace envoy to Syria Lakhdar Brakhimi and under secretary general for political affairs Jeffrey Feltman. The trilateral meeting is to establish the format and nominate participants of the upcoming conference. Russia insists on inviting the representatives of Iran, Saudi Arabia and Egypt to join the conference. The West believes Tehran’s participation is not expedient. 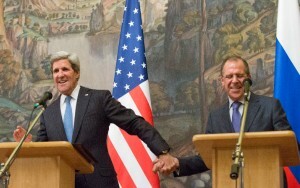 The international conference on Syria is the joint initiative of Russia and US, agreed at the meeting of Russia’s foreign minister Sergei Lavrov and US secretary of state John Kerry in Moscow on May 8. The date of the conference has not been set yet, but the conference will serve as the follow-up to last year’s Geneva meeting that drafted a peace roadmap.